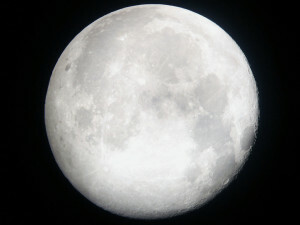 The Station of Sir Sir (Secret of Secret) is symbolized by the Moon, that represents the spiritual station of Maqam al Fardani. When you have learned the Heavenly knowledge at the station of Qalb (Heart), and closed your eyes to the material world at the station of Sir (Secret), you begin to use your heart and enter into the World of Light, Alam al Mithal. This is the state of the Mithaliya Arwah (Spiritual Perfection). First at the Station of Qalb (Heart) you learn the Knowledge of Certainty (Ilm ul Yaqeen), then at the station of Sir (Secret) you begin to use the Vision of Certainty (Ayn ul Yaqeen). Once you know the Divinely knowledge, and see with Spiritual Vision, then it become the Truth of Certainty (Haq al Yaqeen) for you. Hearing and Seeing leads to subtlety of the soul and you enter into the Alam al Mithal (World of Light). 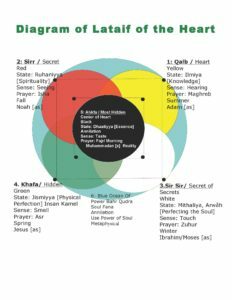 Spiritual Perfection (Mithaliya Arwah) is the realm of the Highest understanding of what you can achieve in the world of light. The Souls perfection will perfect your Physicality allowing you to reach to Physical Perfection. Allah will take from the believers their Dunya and will exchange Akhira with them. This is the best of bargains. Sayyidina Abu Bakr As-Sadiq. Abu Arwah Guide of the City is the Father of all Siddiqeen. We go from the station of Sir (Secret) [3rd Station], it passes the [5th station] Akhfa (most Hidden). 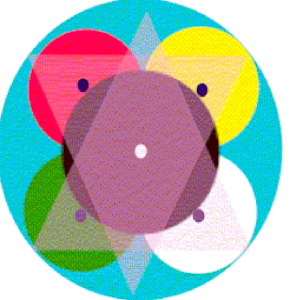 Akhfa is of he Divinely Presence and is black because it represents annihilation. That if you are entering into the Divinely Presence- Akhfa أخفاء because it has the alif ا of maqam al-ihsaan احسان, has the alif of Islam اسلام, anything related and in the Divinely Presence carries ‘izzatullah and the reality of the alif. It (akhfa) carries that black because it’s a station of annihilation, that when you enter into the ocean of annihilation is to enter into the oceans of nothingness. The colour black is black because it absorbs all colours and gives no colour back. And then we get to the two gates that enter at the bottom of the lata’if which are from the Sir o Sir and then the Khafa. Allah (Azza wa Jal) says in Surat Isra verse eighty that: this is the gate of the Siddiq. Maqaa as-Siddiq. Yaa Rabbi let me enter from the gate of the Siddiq, the trustworthy honored gate, to exit from the gate of the Siddiq to the sultanan naseera, into the presence of the sultan. So then they translate the sultan as ‘an authority’, why don’t they just translate sultan as sultan? Means let me to enter the presence of the sultan. It means this gate of the Siddiq, this gate is into the presence of the honored sultan, which is the presence of the sultanan naseera, is the presence of Sayyidina Muhammad (salallahu `alayhi wa sallam). We are asking: yaa Rabbi with these realities You are opening, that for Sayyidina Jibreel to dress the soul, and Sayyidina Mikhail is dressing, and these servants are supported by these angelic realities. They take from these angelic realities. Means they take from Sayyidna Jibreel the knowledges that are being bestowed upon the soul, they take the support from Sayyidina Mikhail to struggle in the way of Allah (Azza wa Jal) and to dress their sustenance and bless their sustenance. Then comes Sayyidina Azrael and Sayyidina Israfil. Sayyidina Azrael is on the Sir o Sir and is coming to teach you how to die. That I have to come to teach you to go through the gate of the Siddiq, means to leave this dunya (matrial wolrd) with a way that Allah (Azza wa Jal) gave to you, to leave this way in a noble and honored way. Don’t wait for Allah (Azza wa Jal) to come and call you back in a condition that you don’t know what condition you are in, but mawt qabl al-mawt (dead before dead). That if you want our way, we will come, Prophet (salallahu `alayhi wa sallam) will send us (angels), to teach you that at every moment not to be attached to this world. And every test will begin to come to you so that you don’t hold the world like this (tight fisted): O I am not going to change, this is what I want. No, no this world has to be like a string for you, if they pull it, it falls out of your hand, that there is no attachment. That is through Sayyidina Azrael. Sayyidina Azrael begins to come to the servant and keeps teaching, that death is coming, death is coming, lose the taste of this dunya, hub ad-dunya and direct yourself to the hub of Akhirah and to the love of Akhirah, which is to the love of Sayyidina Muhammad (salallahu `alayhi wa sallam). Then begin to open the secret of ayat al-kareem that how yaa Rabbi constantly reciting: yaa Rabbi let me leave from the gate of the Siddiq. It means he begins to teach you how to crush the form and then the soul begins to come out. You feel it in the contemplation, when you begin to train in contemplation, that you are entering into a state of death. You begin to meditate and make tafakkur and breathe listening to salawaat and you don’t even move. 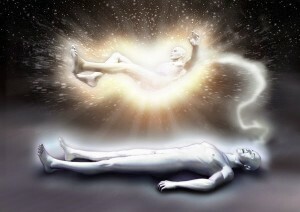 You are just breathing as if you are entering into a state of death, where the energy is dropping, energy is dropping and you feel your soul is coming out. That is where Sayyidina Israel has to come and train the servant that, die; that every desire you have, let it die. Every hope and want you have, let it die. All that you want is Allah’s Will. What you wanted for this world, leave it. What you hoped for this world, leave it. Means surrender yourself to the will of Allah (Azza wa Jal). That becomes the biggest struggle, biggest battle, that you knew I had many thoughts, had many wants, had many desires for myself all of which may be different from what Allah (Azza wa Jal) wants. And he comes to assist that servant to let it go, let it go, let it perish, let everything to perish. Everything perish except the will of Allah (Azza wa Jal). When the servant can enter into that state, understanding the testing at that state, they say “uh…” [they give up]. That is the guide who comes into their life. Every time they are depressed and sad and upset, the purpose of the guide is to coordinate, that what you are feeling is correct, it is what Allah (Azza wa Jal) wants you to feel. That just give it up, your desire give it up. What Allah has in store for you is far greater, what Allah has in store for you is far better. What Allah wants for you is only the best. What you want for yourself may not be good for you. So then they enter a deep struggle with themselves and many become bi-polar where they are happy and then sad, happy and then sad, happy and then sad. Why? because this is the battle, no, no I want this, no no I can’t have it. No no I want to have this, no no I can’t have it. And Sayyidina Azrael is coming to teach, mawt, mawt (dead), let everything go, eventually swwwwsh with difficulty you feel yourself moving into that presence. That opens the secret of every mushkilat, and difficulty. That without difficulty the servant becomes too comfortable within their physicality, they are building right here on Earth a Paradise within themselves. So the reality of every difficulty, that Awliya are teaching us difficulty is coming, tests are coming, why? To begin to crack. As soon as difficulty comes you find your tafakkur so powerful. As soon as you cry and you are sad and upset about something, your tafakkur becomes very powerful because of your love for Allah, so you run into His Divinely Presence and that is the secret of zalzala. That next month [Dhul Qidah], opens the secret of zalzalah (Earthquake). Zalzalah Allah (Azza wa Jal) describes that: when We crush something there must be something hidden inside that wants to come out, if I don’t crush it, it doesn’t come out. Just like the womb the baby has to come out, the baby can’t sit there for five years, at a certain point the reality has to be born. So when the servant is struggling Allah is reminding, then malaaikah are reminding, Awliyaullah are reminding, that Allah (aj) wants to bring the reality of the soul out. It means from the 10th [lunar] month into the 11th month begins the process of bringing the reality out, so by the 12th month their hijrah (migration) is in the Divinely Presence. So Sayyidina Azrael comes to teach the servant how to have your desires die. Sayyidina Azrael represents death and that is the white (station). That is why you are buried in a white fabric. That is why you make Hajj in this white fabric. Why? It symbolizes nothing, be nothing, don’t make yourself to be different from other people. Means then when we are passing from this Sir as Sir (Secret of Secrets), passing through this Akhfa, then maqam Sir as Sir, from the Sir (Secret) to Sir as Sir (Secret of Secrets), then this is the stations of light, that we talked a few nights ago before that are under the authority of Sayyidina Ibrahim and Sayyidina Musa alayhis salaam. Sayyidina Ibrahim alayhis salaam describing that: if you want to enter into these realities and enter into the Divinely Presence, enter into the oceans of faith, there is a big fire in front of you. 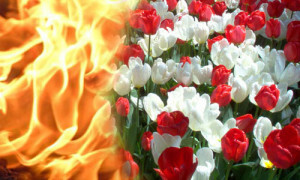 What people call the fire of jahannam (hellfire). 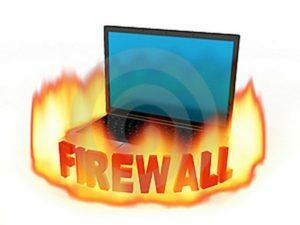 What we use in computers is a firewall. You have a computer, it’s a firewall. The firewall is for what? It is to defend the server against viruses, against badness and bad characteristics. They begin to teach us that your characteristics, your bad energy, your bad ideas, your bad understanding, they won’t be allowed in Divinely Presence. They are going to pass through the firewall. They are going to pass through that cleansing. They are going to be washed. Then they teach you: lose all other than what Allah ‘Azza wa Jal wants. Anything that you are taking with you of a desire, of a character, of something that not pleasing to the Divinely Presence, it’s going to burn in that fire like a moth that is directed to the flame. Means that lose those desires now so that you don’t face the difficulty of the grave. We are not going to hear like Sayyidina Musa alayhis salaam; these are from Ulul ‘Azam (Arc-prophets/Major Prophets). But what you will begin to hear with Divine love is you’ll hear your own consciousness: the lower conscious within the heart connecting to the higher conscious within the heavens. There is a portion of the soul that always in Divinely Presence, like a satellite wanting to communicate to us but blocked by the ego and the bad character. 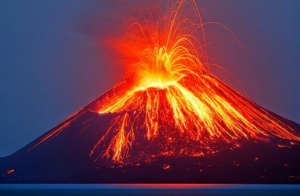 When this fire is controlled and bad characteristics are controlled, this consciousness begins to open and the servant begins to hear themselves and hear their coordinates, hear what the Divinely Presence wants for us. That the perfection of faith is to hear and to believe, not to see and to believe. See and believe is budt Parast (idol worshipper), that they have to see everything. They have to make an idol of everything and then they believe. Prophet sallallahu alayhi wa sallam wanted the perfection of iman (faith); for us is that you merely hear and move towards your belief. Open the perfection of your hearing.